One four-legged friend at a time, Ph.D. student Dr. Heather Fowler is giving back to the community as a volunteer veterinarian for the pets of low-income and homeless Seattleites. At about noon on the second and fourth Saturday of every month, dozens of homeless and low-income Seattleites and their furriest friends start to snake around the block of Pioneer Square’s South Washington Street. The draw? 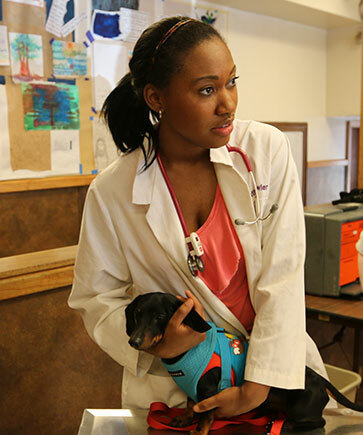 The Doney Memorial Pet Clinic — a pop-up facility that sets up shop in the Union Gospel Mission and offers free veterinary care from 3–5 p.m. thanks to volunteers like Dr. Heather Fowler, who’s working toward her Ph.D. in the School of Public Health’s Department of Environmental and Occupational Health Sciences. With the help of Fowler and other dedicated members of the community, the Doney Clinic aids those those who couldn’t otherwise afford veterinary care. Fostering a healthy human-animal bond is at the core of Fowler’s studies. She’s found a mentor in Dr. Peter Rabinowitz, who directs the UW’s Center for One Health Research (COHR), and she’s taken on the role of COHR’s associate director of Animal Health. From farmers with their livestock to veterinarians with their patients, COHR’s mission is to investigate health as it relates to humans, animals and their shared environments — and develop innovative solutions for a healthy coexistence. According to the American Veterinary Medical Association, the human-animal bond is a mutually beneficial — and meaningful — one that influences the health and well being of both human and animal on an emotional, psychological and physical level. Considering “dog” is synonymous with “man’s best friend,” this is somewhat intuitive. But in the homeless and low-income population, the ties run a little deeper. Christine, who represents a much larger Seattle population, gives back to the Doney Clinic as she’s able, whether it’s through volunteering or donating any extra money — even in hard times. Fowler’s research and goals are focused primarily on the occupational health of animal workers in environments such as dairy farms and veterinary clinics. In veterinary clinics, workplace hazards include anything from bites, scratches and infectious diseases to being exposed to toxins and radiation — which makes her outreach with the Doney Clinic the perfect place to put both her clinical and occupational health chops to use while leveraging her education to give back. In the future, COHR hopes to partner with the Doney Clinic to create a clinic that treats both the pet and the owner at the same time.